Defunct AV, video and TV consumer publications. - audiotools.com. Defunct AV, video and TV consumer publications. A monthly mid and high end audio and home theatre hardware and software magazine published by Tomart Publishing of Chevy Chase, Maryland, USA (Now apparently defunct). Time line is unknown but it appears to be early/mid 90’s to 1998 or so. 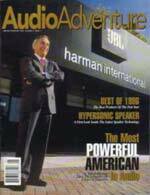 While AA had media reviews and some AV content in each issue it was squarely aimed at audiophiles. The best thing about the magazine was also what was worst about it, the magazine featured hardware reviews that where relatively short and to the point with a slightly misguided scoring system that had an overall score plus 5 individual scores for indefinable concepts such as “tonality” and “imaging” that were frankly not helpful, but they also had expanded reviews that were an amalgamation of an industry feature, interview and a review. These “feature reviews” could be extremely informative since they dragged out in the open background information that you will usually never find in hi-fi magazines, the problematic thing was that they had a slight tendency to read like PR material, especially the introductions written by the editor. This alongside other industry features makes some back copies of the magazine an essential read while others are barely worth opening except for those with a serious hi-fi obsession. Editor was Thomas O. Miiller who was later with The Absolute Sound, other contributors included Tony Rago and Adam Walinsky. Resources : Audio Aristry feature review - A shortened example of an AA feature review. 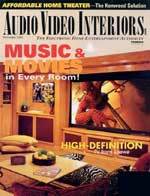 Magazine started in 1986 in New Zealand by Michael Jones under the name Zounds but changed its name to AudioVideo in 1987, one of the first English language home theatre magazines out there, although it primarily covered hi-fi products. Mainly a review and opinion magazine, it was closed down in 1995 but Mr. Jones went on to found AudioEnz less than a year later. A pure home cinema monthly magazine originally founded in 1989 by McMullen Argus Publishing/Primedia publications in the USA and started out as a home theatre lifestyle magazine but quickly morphed into a curious but sometimes effective blend of an interior design magazine and a traditional AV publication. Where it differed from other AV magazine was the high number of feature articles that showcased the home cinema installations of the filthy rich, if we recall correctly the lowest cost installation featured one year in the early 90’s was about 100,000 USD (close to twice that in today’s money). While this may sound elitist, snobbish and even banal, it actually worked out quite well since the quality of the photographs and text was above average for an American publication and the layout was better as well, for the time anyway. In worst case scenarios, these articles could be compared to the “aspirational” articles you find in home interior magazines. But in actuality these features could be quite helpful, even if only as sources of ideas and small tricks that you were not aware of beforehand and the magazine even published diagrams for those that wanted to study or emulate the featured designs and later made diagrams downloadable from their website. Less interesting were the reviews of AV equipment featured in the magazine, they were very light on technical info and no technical tests appeared to have been performed, in other words they tended to be short and chatty personal evaluations as much as a proper review. The magazine started to go a bit downhill in the latter half of the 90’s with the gear reviewed being noticeably cheaper that it had been before and the installation/interiors articles started to feature noticeably less exorbitant designs, it is not known if this was a change in editorial policy or if they simply ran out of billionaires with swanky home cinemas. Although featuring more installations that were within the price range of the average reader or at the least close to it may sound like a good idea this was in praxis something of a disappointment since the cheaper installations tended to be self-designed and often self-built while the more outrageously priced one usually had a lot of professional input, this simply meant that in addition to being less inspirational the articles on the cheaper rooms simply contained very little information that was novel or helpful, the solutions that the builders of smaller rooms employed were usually the sort of solutions you would have thought up yourself anyway. There were some indicators that the company publishing AVI it was losing interest in it around the turn of the century, but there were an usually high number of subscribers complaining about problems with subscription renewals, the company did in the end stop publishing it in 2003/4 or thereabouts as a separate publication after circulation had fallen below 35000 copies, but continued it as an occasional bonus magazine for the subscribers of sister rag Home Theater Magazine. The publisher re-launched it in 2008 as Home Theater Design although primarily a separate publication occasionally sent out with copies of Home Theater but now it was now also available as a digital download, or supposedly so, the site had a huge link and a picture of a PDF file but we never got it to work. By 2010 the magazine was more or less a dead duck although there were occasional blog posts on their homepage and it has by now been relegated to the dustbins of history. USA based print magazine launched in June 1996 by publishing house CurtCo Freedom in an attempt to replicate in the AV sector the success the company had experienced in the computer market with Portable Computing Direct Shopper. The magazine was folded after just a year, it sold quite well but advertisement sales never reached expectations and thus was run at a loss. The magazine reviewed AV and hi-fi equipment, primarily budget products although some hid-end products were to be found there from time to time, A/V Shopper also had a small section that reviewed films on laserdisc and VHS in addition to music CD's, but a lot of the articles where overviews and simple multi-item reviews and did not contain a lot of information in retrospect. Originally founded as an offshoot of Stereophile magazine as the “Stereophile Guide To Home Theater” and covered high end home theatre equipment that was not appropriate to discuss in hi-fi only Stereophile and too high end to be discussed in sister publication Home Theater Magazine, but we understand that reviews of very high end equipment were hugely unpopular with the HTM readership. Name was later changed to “Stereophile's Ultimate AV”, then “Ultimate A/V Guide” and then in May 2004 it was re-launched as just the “Ultimate AV” although the Sterophile name was usually found somewhere in the header. The magazine was from the on published 10 times a year until it folded in 2008 or 09. Their website was however kept active and published blog postings containing news and short reviews that did not appear in either of their sister publications, but in 2011 it was closed down altogether. Quarterly UK print magazine published by VIP publications, that reviewed consumer satellite equipment and published information on actively transmitting TV and radio satellites in addition to doing the usual tutorials and technical articles. The magazine was started sometime in the 90's and featured much more information content than reviews, the same company did after all publish another magazine called What Satellite TV that was more of a usual consumer review magazine. This does make older copies of the magazine a more interesting read to a degree both because there are seriously useful articles on older hardware and other info that is still useful but it also means that a large bulk of the mag is pure nostalgia, what is more useless than 10+ year old satellite TV channel listings after all? They have in other words managed to have dated both more and less than the magazines around them. The magazine was renamed Satellite and Digital Choice in 2003 and enlarged, now no longer exclusively centred solely on satellite broadcasting but added information on Freeview and other DVB based digital terrestrial TV broadcasting options that were available in the UK at the time such as ITV Digital, and in general the boom in the UK digital TV broadcast market meant that the magazine was able to move to a bimonthly format in late 2003/early 2004. The title was bought by Future Publishing in 2005 and closed down so not to compete with their other digital TV magazine offerings. 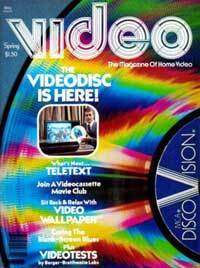 USA based print magazine that reviewed video and laserdisc equipment, televisions and films on video tape in the 80's and in the 90's added coverage of home theatre equipment in general. Bought by Hachette in the 1990's and in 1998 the decision was taken to fold the content of Video into Stereo Review to form a new magazine called Stereo Review's Sound and Vision, now known as just Sound & Vision. Kevin Miller was the main TV reviewer for the magazine during the mid-90's (he was later with The Perfect Vision). UK based monthly print magazine founded in 1980 or 81 that initially covered the video and camcorder revolution and was something of a trailblazer in that field. Became notorious for its constant minor changes to its name and layout in the latter stages of its life, initially to What Video & TV in the early 90's to reflect less importance of video and camcorders and to reflect the fact that the magazine was by then covering Televisions as much as video. Changed its name to What Video Widescreen Entertainment around 2002 to reflect that it was becoming more DVD oriented, as more and more home theatre and DVD content was moved to sister magazine Home Cinema Choice the name was changed to What Video & Widescreen TV in 2003, and in around 2005 the title was sold to Future Publishing and the name changed to the more up to date What video and High Definition TV and finally during the last couple of years of the magazines lifetime the name was the subtly altered to What Video & Hi-Def TV. In 2009 Future publishing announced that the magazine would from now on be issued in a digital format only, one release showed up in that format then it was closed down. 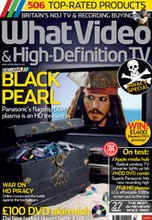 Resources: The last issue of "What Video & Hi-Def TV" on issuu.com. Trade magazines are publications intended for consumption by people that are employed in the business of selling making or servicing audio and AV products etc., be it intended for the professional or private markets. Traditionally these were paid for and often extremely expensive and there are still a few titles about that can only be had with a quite expensive “memberships” to industry associations and suchlike, but the business model that has won in the last couple of decades is the advertisement supported publications that are sent out free to qualified personnel in the magazine's home country and either sold to those that are outside of the trade or that are outside of the country, or being offered to those as a free electronic download. A trade magazine intended for the AV install market issued in the United Kingdom on a monthly basis. Originally started by Diva Corp in around 2002 and then edited by Ben Curtis and was a sister publication to retail trade magazine Inside Hi-fi. Later sold to Rephoto Publishing who ran it until the summer of 2009 under the guidance of editor Daniel Sait but when the magazine was closed he went on to found Essential Install. A trade magazine issued in the United Kingdom on a monthly basis later re-named Inside Hi-Fi & Home Cinema. Originally started by Diva Corp in the latter half of the 1990’s and then edited by Ben Curtis, later acquired by Rephoto Publishing alongside sister publication Custom Installer under the stewardship of editor being Daniel Sait, but appears to have ceased publication in late 2008 or thereabouts.